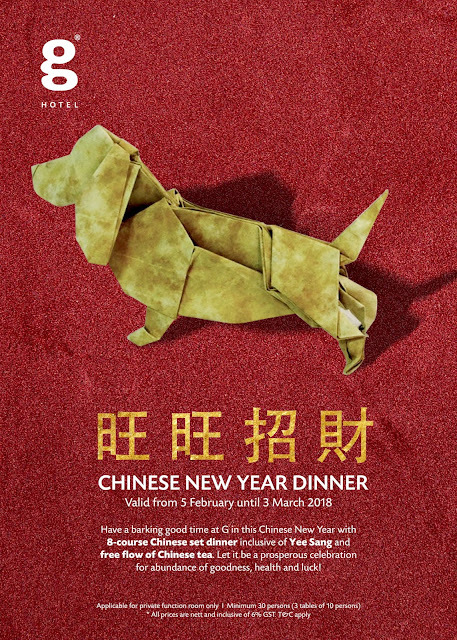 Celebrate Chinese New Year at the G Hotel this year!!! RM1688 respectively per table of 10 persons. Booking is required at the function room for Happiness package (RM1,288), Prosperity package (RM 1,488) and Longevity Package (RM1,688). Guests can now pre-book just one table for any of the 3 CNY dinner package (10 persons per table). 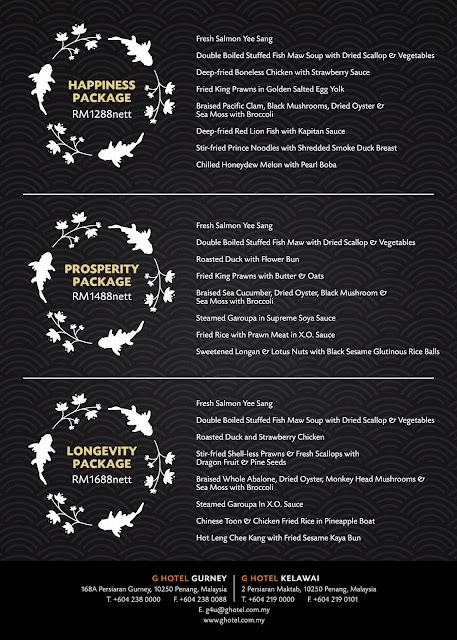 The CNY 8-course dinner is applicable at both G Hotel Gurney and G Hotel Kelawai. Jam filling. These homemade desserts will definitely help to end the dinner with a high note. All the 8-course Chinese set dinners are inclusive of Fresh Salmon Yee Sang and free flow of Chinese tea. It is applicable for private function room only with a minimum reservation of 1 table of 10 persons. All prices are nett and inclusive of 6% GST. For booking and enquiries, please call +604 238 0000 for G Hotel Gurney and +604 2190000 for G Hotel Kelawai or visit www.ghotel.com.my for more information. Alternatively, diners could choose to have a delightful buffet experience by enjoying the Prosperity CNY Buffet Dinner in Taste Café at G Hotel Gurney while enjoying the buy 2 free 1 promotion on the 1st and 2nd day of Chinese New Year from 6.30pm till 10.30pm for RM188 per person. 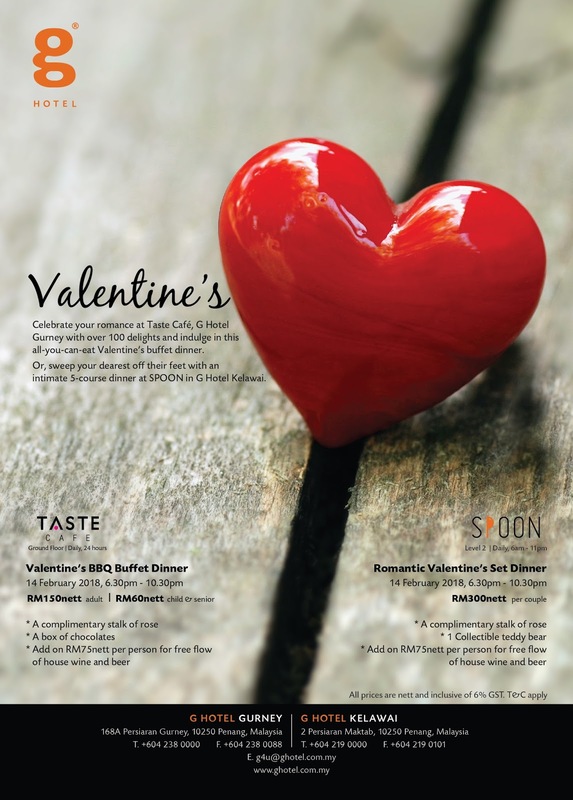 Or dine in the spectacular surrounding of SPOON at G Hotel Kelawai, same time and date for RM108. Indulge in delicacies that range from appetizers and mains to soups and desserts. Highlights include eight treasure chicken broth, fried prawn in golden egg yolk sauce, sautéed flower crab and red bean broth with orange skin. Diners could also make their own desired yee sang and stir up good fortune with the wonderful selection from the buffet with free flow of chilled juice and soft drinks. For reservations or more information about G Hotel Gurney and G Hotel Kelawai information, please visit www.ghotel.com.my or call +604 238 0000 for the booking and assistance.